It's easy to imagine creators of your childhood as working in ivory towers and possessing supernatural abilities. Aren't they what made walking to the store, plunking down 25 cents, and taking home a fresh pack of cards so exciting? If we'd seen the mighty and powerful TOPPS COMPANY as a small collection of NY and PA offices, would we have believed it? This "widescreen" set (note the longer left-to-right length) offers a rare glimpse inside Topps itself and covers 18 groups or individuals that turned ideas into products, products into cardboard, and cardboard into childhood memories. It seems they only printed sets for employees, explaining their extreme rarity today. I'd never seen a Teamates card until their appearance on Topps Archives in 2010 as Team Building Exercise. "They're quick to give credit where credit is due--but not past due!" That's the kind of slogan I would take credit for coming up with. 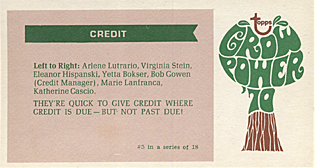 Thanks to the Topps Archives blog for its series of posts breaking down the "Teamates" [sic] set and key employees pictured therein, including Woody Gelman on #15 Product Development and Bill Haber on (probably) #17 Sports Department. See all known cards in Growing a Checklist and all Archives posts under the tag 1970 Topps Grow Power. Value: Robert Edwards Auctions sold a near-set of 17 NM cards for $6518 in 2012, confirming there's enough interest in Topps rarities to pull big price tags. You might never see an individual card for sale outside of an auction. If you do, $100 or more looks likely. Fake / reprints: Don't know of any fake cards in the marketplace. It's possible someone would try it given their current value, but super-rare counterfeits are a Catch-22. When you fake something that's going to auction, it'll also be inspected more than something sold at a show, so it's more likely to be detected. Behind-the-scenes stuff like this is so cool. That 'Grow Power' logo on the back could ONLY be from that era. Yeah, and "Grow Power" is unironic 70s at its best.